Several different stories, from two separate countries, highlight chiropractors helping winter Olympians at the 2006 winter games. One story, from the January 31, 2006, PRNewswire reported that two US chiropractors, Drs. 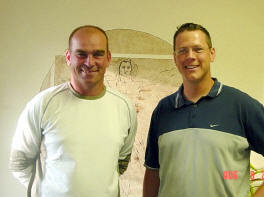 Shapiro and Solomon, have been selected as the team chiropractors for the U.S. Olympic Team during the 2006 Winter Olympic Games in Torino, Italy. The PRNewswire story notes that the athletes seek chiropractic care to maintain their health and improve their competitiveness. The article also notes that with the increased scrutiny surrounding the use of performance-enhancing drugs, "athletes are turning to safe, drug-free health care whenever possible." The second story from the February 9, 2006 Calgary Sun Canoe News reports on how Canadian athletes will also be receiving chiropractic care to help them in their pursuit of gold. In this story, Dr. Uchacz, of Calgary is there to help the Canadian athletes competing in bobsleigh and skeleton, with secondary support to the athletes in other disciplines. The story noted that Uchacz is thrilled to be instrumental in helping athletes optimize their performance. He stated, "The bob and skeleton athletes have a real chance at several medals this time and that makes it quite exciting to be a part of. This is the culmination of four years of development." Another story in the February 10, 2006 St. Petersburg Times also reports on a local chiropractor, Dr. Sage Campione, who has been chosen to be one of 15 American chiropractors representing the chiropractic profession at the winter games. These stories highlight the fact that many athletes see chiropractic as a way to increase their chances of winning while decreasing their chances of injury or lost time. The articles did note that prior to the official recognition of having chiropractors directly as part of the staffs at the games, many athletes went to chiropractors on their own. The PRNewswire article concludes by pointing out just some of the athletes that have relied on chiropractic. They noted, "The roster of Olympic athletes who have benefited from chiropractic care is truly impressive. Star performers such as Derek Parra, Carl Lewis, Greg Louganis, Willi Banks, Edwin Moses, and countless other greats from previous Olympics have taken advantage of chiropractic in order to get a leg up on their competition." Thomas Bjorn is a professional golfer from Denmark who made a bit of sports history at the 87th PGA Championship when he shot a round of 63 and tied the record for the lowest score in a major PGA tournament. However, this accomplishment of sports history and Bjorn's second place finish in the 2005 PGA Tournament might not have been possible without the chiropractic care Bjorn received during the practice rounds prior to the start of the tournament. The August 15, 2005 Daily Record of New Jersey tells the story of how a local Morris County chiropractor can take at least partial credit for Thomas Bjorn's record-setting round Saturday at the PGA Championship. Dr. Patrick Ryan was seeing patients when he received a call from a colleague in London who was the chiropractor for Bjorn. Shortly after this Bjorn, drove straight to Ryan's practice in Randolph NJ, complaining of a restriction in his neck that kept him from turning his head properly in his swing. According to the Daily Record, Bjorn had been forced to stop practicing after six holes prior to the tournament because of pain in his neck that affected his swing. Dr. Ryan performed scans on Bjorn and reviewed information from his London chiropractor and came to the conclusion that Bjorn was suffering from a subluxation of the first thoracic vertebra, the point where the head and shoulders meet. This created severe muscle spasm at the base of Bjorn's neck and prevented proper rotation. Bjorn then received an adjustment, and asked to return the next day. On the following visit a new scan showed Bjorn's imbalance had improved from severe to mild. Bjorn reported that he felt terrific. On Saturday, Bjorn shot a 7-under-par 63. That score tied the record for the best round of golf ever in a major tournament. In interviews after the tournament, the Danish pro credited a new pain-free swing. 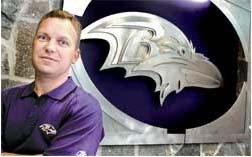 A feature story appearing in the June 30, 2005 edition of the Catonsville Times in Maryland celebrated the 10 year anniversary that a chiropractor had been helping the Baltimore Ravens Professional Football team. Ten years ago the Ravens came to town. At that time Dr. Doug Miller (right) started his relationship with the team that has lasted since then. Dr. Miller became the team's chiropractor by contacting the Ravens shortly after their move from Cleveland and telling officials about the services he provided to other sports teams in the area. He was on the playing field when the Baltimore Ravens won the 2000 Superbowl. He can also be found in the locker room and on the field on most Sundays during football season. Raven's trainer Bill Tessendorf, refers most of the players that Dr. Miller sees for chiropractic care. Tessendorf, who has 32 years of experience as an NFL trainer explained, "A player favoring a knee or an ankle can cause alignment problems elsewhere. A chiropractor can help with a lot of those issues." Dr. Miller explained that chiropractic care still remains misunderstood. Most of his services are not necessarily related to the treatment of injuries. He explains, "It's not just about relieving pain from backaches and injuries," he said. "It's about achieving optimum health. We can do a lot to help with the conditioning of muscles and joints." The article notes that presently almost every NFL team has a chiropractor on staff. A new study published in the February 2006 issue of the scientific periodical the Journal of Manipulative and Physiological Therapeutics (JMPT), shows that patients with chronic neck pain benefit from chiropractic. The authors start off by noting that neck pain is, "a very cost-demanding health problem." The study was performed at the Scandinavian College of Chiropractic in Stockholm, Sweden. In this study patients with complaints of continuous neck pain during the previous 3 months were considered chronic and accepted for participation in the study. Of all those participating, the patients were divided into two groups. One group was a control group with no chiropractic care while the other group received chiropractic. The same outcome measurements were used on both groups to be able to compare the results. A follow up assessment was done on all patients at the time of the initial consultation and then a second time at the end of the 5-week study period which was 2-4 days after the conclusion of the treatments for the patients in the treatment group. The assessments were done to review three areas, symptoms, cervical range of motion, and head repositioning accuracy. Head repositioning accuracy, (HRA) is a test that measures the ability of the neuroarticulomuscular system to reposition the head in a neutral posture after active movements. The results showed that for two of the areas tested, the group that received chiropractic care on average showed improvement. With respect to pain, after the intervention, the chiropractic group showed a significantly lower degree of pain intensity. The results of the testing for head repositioning (HRA) were even more impressive, where significant improvements in all aspects of HRA were seen for the group that received chiropractic care. There was however, no perceivable difference in the groups relative to range of motion at the conclusion of the study. The researchers noted, "The results of this study suggest that chiropractic care can be effective in influencing the complex process of proprioceptive sensibility and pain of cervical origin." In other simpler words, chiropractic helped for people with long standing neck pain.